HONG KONG — As looming budget cuts force the Pentagon to plan for a smaller US navy, China is accelerating the launch of new, increasingly capable warships as part of a sustained drive to become a major maritime power. Shanghai’s Hudong Zhonghua Shipbuilding Company late last month launched the fourth of China’s new 071 amphibious landing ships according to reports carried by Chinese military web sites and the state-controlled media. While most attention has been drawn to the ongoing sea trials of China’s first aircraft carrier, military analysts say the expanding fleet of 20,000-ton landing ships, the biggest domestically designed and built vessels in the Chinese navy, delivers a far more immediate boost to Beijing’s global influence. “Having a significant fleet of large amphibious assault vessels clearly suggests a desire for power projection,” says Christian Le Miere, a maritime security researcher at the International Institute for Strategic Studies in London. China’s naval buildup comes amid mounting maritime tensions in the Asia-Pacific region, which is likely to be one of the main geopolitical stress points in the coming decade. Military planners previously had focused mainly on a potential conflict in the Taiwan strait. More recently, however, Japan and China have locked horns over islands each claims in the East China Sea; Vietnam, the Philippines and other nations are disputing territorial claims with China over parts of the South China Sea thought to be rich in oil and gas. The US Navy has announced it will deploy its own new amphibious assault vessels, the Littoral Combat Ships, to the “maritime crossroads” of the Asia-Pacific theater, stationing them in Singapore and perhaps the Philippines. Xi Jinping, the man destined to become China’s new president later this year, called for enhanced military cooperation between the Pacific powers during a meeting with US Defense Secretary Leon Panetta on Monday in Washington. Xi, the son of a famous guerrilla commander from the 1930s, also met with President Barack Obama and was treated to a rare show of honors at the Pentagon, including on a 19-gun salute. But Panetta, alluding to the strains in the relationship, called for more transparency from Beijing about its military build-up. 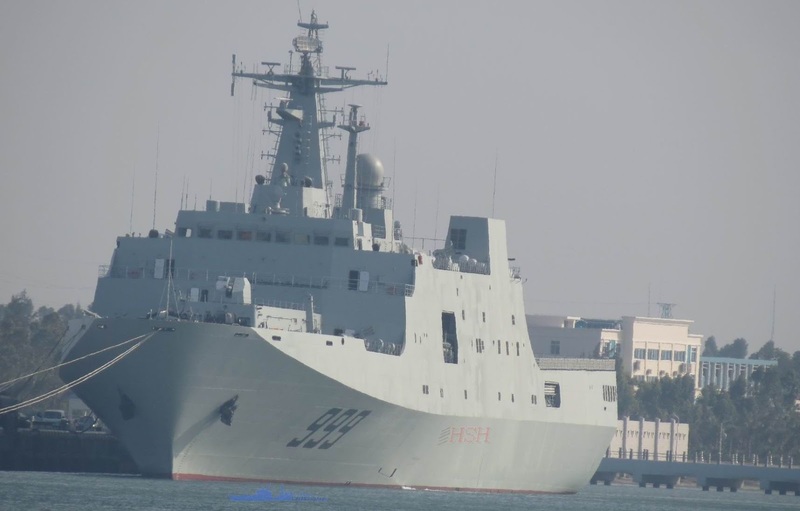 The Chinese navy is expected to deploy up to eight of the type 071 ships that can carry up to 800 troops, hovercraft, armored vehicles and medium lift helicopters. The first of the class launched in 2006, the Kunlunshan, has already deployed with Chinese naval forces to the Indian Ocean and the pace of construction appears to have quickened with the third and fourth vessels completed within the last five months. And, military commentators and retired Chinese naval officers say, early design work has already started on a bigger, more capable landing ship. For the Chinese navy, the country’s thriving commercial shipbuilding industry is providing a springboard for further improvements in the size and sophistication of new classes of warships, military experts say. China in 2010 overtook South Korea to become the world’s biggest shipbuilder and industry experts say the leading state-owned shipyards are steadily improving skills and technology with the launch of bigger and more complex oil tankers, container ships and other, more specialized vessels. Along with more than two decades of rapid growth in military spending, this shipbuilding expertise has transformed the Chinese navy from an obsolete, coastal defense force to a blue water fleet that is expanding its influence into the Pacific and Indian Oceans. China’s best warships and submarines are now armed with advanced air defense weapons and long range, anti-ship missiles. In its annual report to Congress on the Chinese military, the Pentagon last year said the People’s Liberation Army (PLA) navy now has about 75 major warships, more than 60 submarines, 55 medium and heavy amphibious ships and about 85 smaller, missile-armed fast attack craft. As a major trading power with a growing dependence on imported energy and raw materials, this naval expansion is crucial for the country’s security, according to Chinese military planners.